It was kind of Steven at Sainsbury’s to offer to check their stock of The Real Easter Egg at their store in Canterbury, following yesterday’s revelation that Sainsbury’s don’t, in fact, stock it anywhere. He must have given up searching, but Paul eventually responded: “They are not stocked in this store. You can request a product for a store via this link. bit.ly/21oWP3I. Paul.” This confused Sainsbury’s customer Linzi James, who, eager for her Nectar points, tweeted: “This link allows me to see that there is a Sainsbury close to me. How do I request a ‘Real Easter Egg’ from there?” To which Andy replied: “Hi Linzi! Sorry we aren’t running the real Easter egg this year due to lack of demand in previous years. Andy”. So, no Nectar points for Linzi. Now this is interesting, because Sainsbury’s did indeed place an order for The Real Easter Egg in 2013, and it was for 2,000 eggs. The Meaningful Chocolate Company acknowledge as much on their website: “Now, for the first time, leading supermarkets Sainsbury and Tesco will stock The Real Easter Egg, though stock levels will vary,” they announced. But there was a hidden litany in that stock-level addendum. A store like Tesco will ordinarily order around 40,000 eggs for a UK-wide promotion. Sainsbury’s ordered just 2,000. This might seem like a lot, but it is equivalent to an order from three schools, and amounts to no credible commitment at all. And this order was only placed after numerous approaches. The first time, Meaningful Choc representatives were thrown out. The second time, Sainsbury’s told them rather scornfully that it was not a credible product (..it has sold over a million..). But then a new buyer came in and said they would order some. The Meaningful Chocolate Company honoured this very small order. It might have been nowhere near the stock level carried by Tesco, but there was hope that the acorn might just sprout. Sainsbury’s requested delivery of the remaining 1076 eggs, but the delivery driver was turned away at the gate, leaving The Meaningful Chocolate Company to pick up the costs. Ordinarily, a lorry would be loaded with 10,000 eggs: 1076 was hardly worth the transport costs in the first place. So it would appear that the Sainsbury’s order was not a credible buy or plausible national trial at all, and despite the continuing success of The Real Easter Egg (and Advent Calendar) in other big supermarkets, only Sainsbury’s remain hostile to the idea of mentioning Christianity at Easter and Christmas. 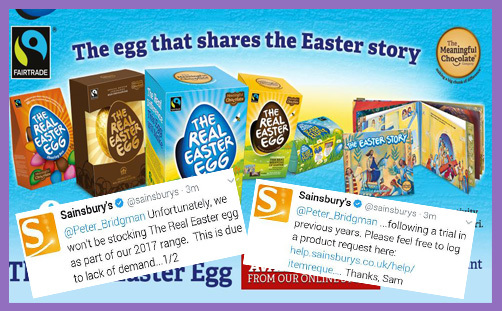 Could it be – might it conceivably be – that Sainsbury’s placed such a meagre token order simply to permit Steven, Paul, Andy and Sam to tweet, “Hey, we did stock this Jesus egg in 2014, but it was so rubbish nobody wanted it”, thereby defaming and denigrating The Real Easter Egg to their 485,000 followers? That’s half a million people who might now be inclined to think that The Real Easter Egg isn’t quite on par with Cadbury Wispa, Lindt Golden Bunny or (of course) Sainsbury’s own Belgian Dark Chocolate Easter Egg with Cocoa Nibs, Taste the Difference. What a great way to drag the real meaning of Easter – the death and resurrection of Christ – through the mud.